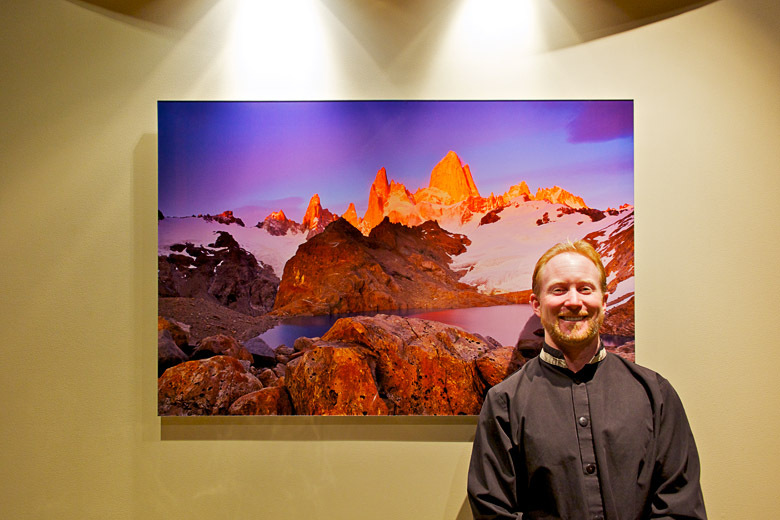 I am incredibly excited to have 2 of my new acrylic face mount prints on permanent display at Etheridge Family Dentistry in Seattle, WA. 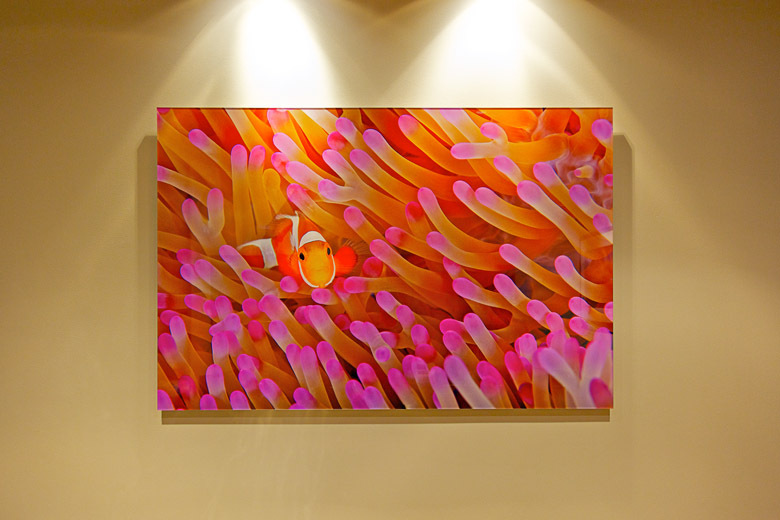 The 35×50 Laguna de los Tres Sunrise 5 print above is from my trip to Patagonia last January and the 35×50 False Clownfish 23 image below is from my trip to Raja Ampat last March. They look absolutely stunning (even with Dr Ty standing in front of them). Both of these acrylic face mounts were created by West Coast Imaging. WCI offers several paper options. I chose the Epson premium glossy paper, because it most closely matched the colors of my own Epson printer. They are mounted directly to 1/4″ acrylic, backed with a white dibond backer, a metal hanging system is attached, and the edges are flame polished. I have not finalized my price list for these spectacular prints, but they will cost about 2 to 3 times the price of my current Museo silver rag prints. To celebrate the 2011 holiday season, I will offer these ready to hang prints at the introductory price of 2 times my current print prices. It takes about 3 weeks to create them, so all orders that are placed no later than next Friday December 2 will be guaranteed to arrive in time for Christmas. During my visit to the Misool Ecoresort in Indonesia, I attempted to photograph as many landscape images as possible, but was limited by whether I had a boat available to me. On the return from one afternoon dive, Thorben showed me some fantastic rock pinnacles backed by a palm lined beach on the far end of Warakaraket Island. He offered to take me back to this location at sunrise, so for several mornings in a row, I woke up at 5am and looked out towards the eastern horizon. Almost every time, it was super cloudy and pouring rain, so I went back to bed rather than enjoy a 45 minute boat ride in the dark while getting soaked. There are some things that are just not worth doing. After 3 days of waking up early and going back to sleep, the weather finally seemed to be cooperating so we went for it. Guess what? I still got skunked and returned without the image I was hoping for. So, I decided to try one last time, but rather than the next morning I went back that afternoon. In order to get back here, I had to skip the late afternoon dive. I got dropped off at this incredible location and had it all to myself. I had a bit of a Robinson Crusoe moment when I wondered what would happen if they forgot to come back to get me. Would I carry on conversations with “Canon” like Tom Hanks did in the movie Cast Away? I enjoyed my quiet time by myself, but eventually the boat returned. I asked them if they wouldn’t mind leaving me for a few more hours until the sunset and they agreed. My buddy, Brent decided to stay with me and I think he used my camera with his memory card to take this same picture. The sunset light was a bust, but we swam around these pinnacles for an hour, chatting the entire time about life. It’s moments like these that make the memories that I cherish from my travels. I created this image using my Canon 5DmkII, Carl Zeiss 28mm f2 ZE lens, and Singh-Ray LB Warming Polarizer. This image required minimal processing using Aperture 3 and Photoshop CS5. In my early years as a professional nature photographer, I became enamored with Native American rock-art sites in the Southwest. I studied the photographic work of the master landscape photographers and emulated their style, if not their outright images. Since, my initial forays into the Southwest, I have visited rock-art sites in Alaska, Hawaii, and the Pacific Northwest. The photographic skills that I learned served me well when I had the opportunity to visit several Papuan rock-art sites during my recent visit to the Misool Ecoresort in Raja Ampat, Indonesia. Unlike land based sites that can be hiked to, these panels overhung the water and required a boat to visit. They are located in Southeast Misool where mushroom-shaped islands jut out of the ocean and form a myriad of twisted passages and channels that any landscape photographer could devote months to exploring. Researchers have estimated that these pantings are in the neighborhood of 5000 years old. The red pigments are most likely iron-oxides which would have come from far away in central Papua. The main figures depict tuna, dolphins, and other unknown symbols. 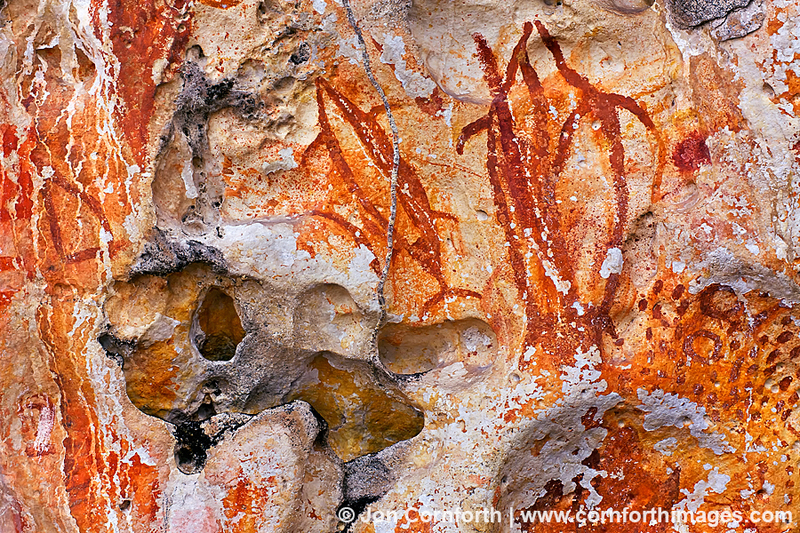 I was drawn to these paintings that included the limestone holes and erosion patterns. I created this image while precariously standing on the bow of the boat and hand-holding my Canon 5DmkII and Carl Zeiss 50mm f1.4 ZE lens. This image required minimal processing using Aperture 3 and Photoshop CS5. During my trip to the Misool Ecoresort in Raja Ampat, Indonesia, I put most of my effort into underwater photography, but also photographed landscape images whenever a boat was available. Numerous islands beckoned to be photographed, but I was especially intrigued by a series of small, rocky islands that I could see on the northern horizon. 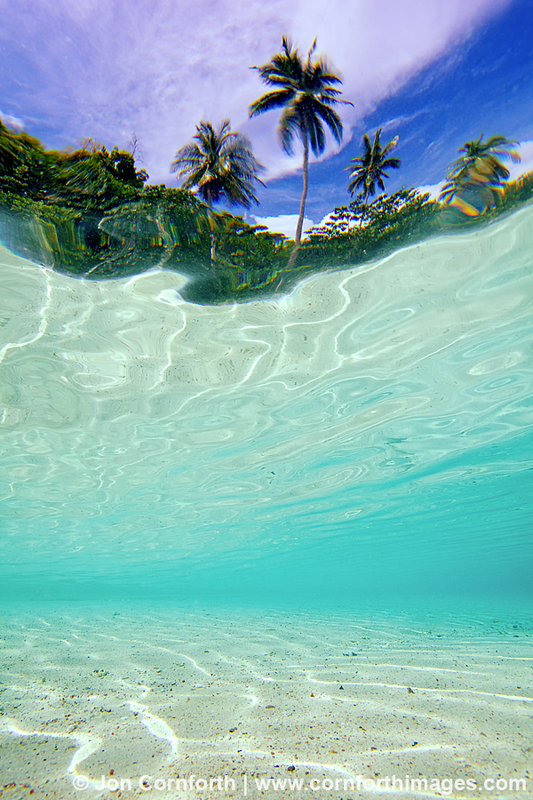 From a distance, the Palau Jam group appeared to barely be above water and crowned by only a few coconut trees. After staring at these islands for almost 2 weeks, I had an opportunity to borrow a boat for the 45 minute journey. I invited the resort’s other guests on all of my forays, and on this afternoon Thomas & Nigel from the UK decided to join me. As we approached the islands, I noticed that the largest had a magnificent sandy beach which made the turquoise water glow in the afternoon light. I composed this scene to the best of my abilities given the stormy conditions while standing in the shallow water. I tried to photograph the sunlight refraction patterns, but it was too windy to see them. However, billowing storm clouds added the required layer of drama and made this my favorite landscape photo from my trip. I created this image using my Canon 5DmkII, Carl Zeiss 28mm f2 ZE lens, and Singh-Ray LB Warming Polarizer. This image required minimal processing using Aperture 3 and Photoshop CS5. 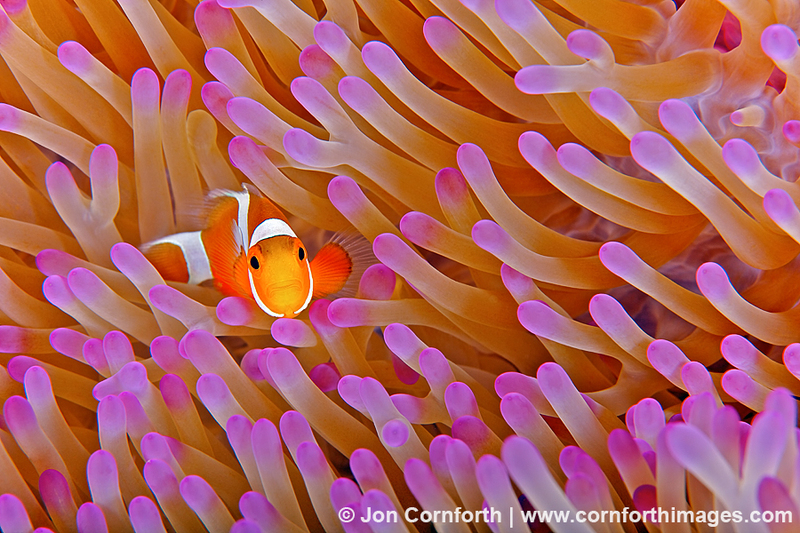 What else needs to be said about clownfish, other than they are iconic and adorable? 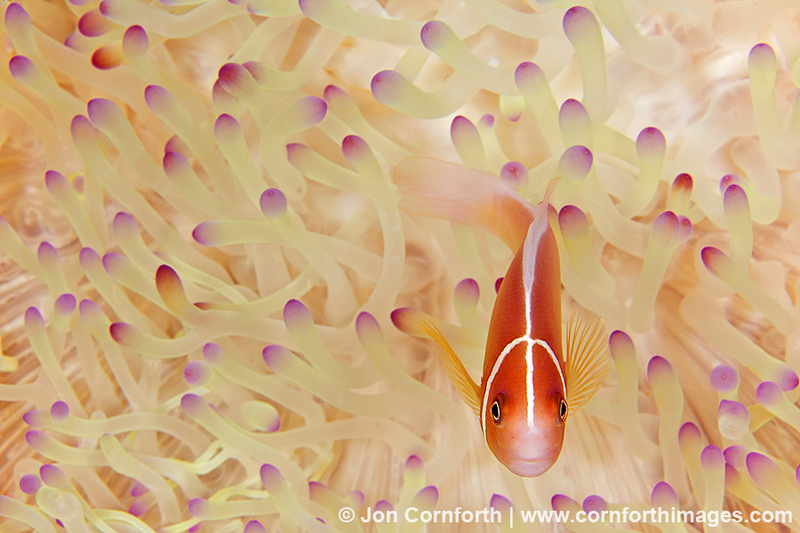 There are also many different types of clownfish, like this skunk anemonefish. As my regular readers can probably tell, I had a plethora of photographic opportunities while scuba diving during my visit to the Misool Ecoresort. This yellow anemone was aesthetically appealing to me and the skunk anemonefish was less agitated than most of the false clown anemonefish that I photographed. Heck, this one even has a slightly less dour frown on its face. Do I even sense a smile because it knew that I was going to make it famous? I created this image using my Canon 5DmkII and 100mm f2.8 macro lens in my Ikelite 5DmkII housing with dual Ikelite DS160 strobes set on TTL. This image required minimal processing using Aperture 3 and Photoshop CS5. During my recent trip to the Misool Ecoresort in Raja Ampat, Indonesia, I focused most of my effort on underwater photography, but I also attempted to photograph landscape images. My initial forays by boat were disappointing. During one of my first attempts, I tried climbing up what was maybe an 80′ pinnacle. It was incredibly dangerous, so I quit trying to climb on the razor sharp islands and focused on the numerous white sand beaches dotted throughout the immediate vicinity of the resort. One of my objectives was this fantastic little beach that was maybe 100m across the channel from the dive jetty. I motored by it while diving everyday for a week before I had the opportunity to visit it. Before I set up my camera, I removed the ever-present plastic debris that was on the beach at the high-tide line. 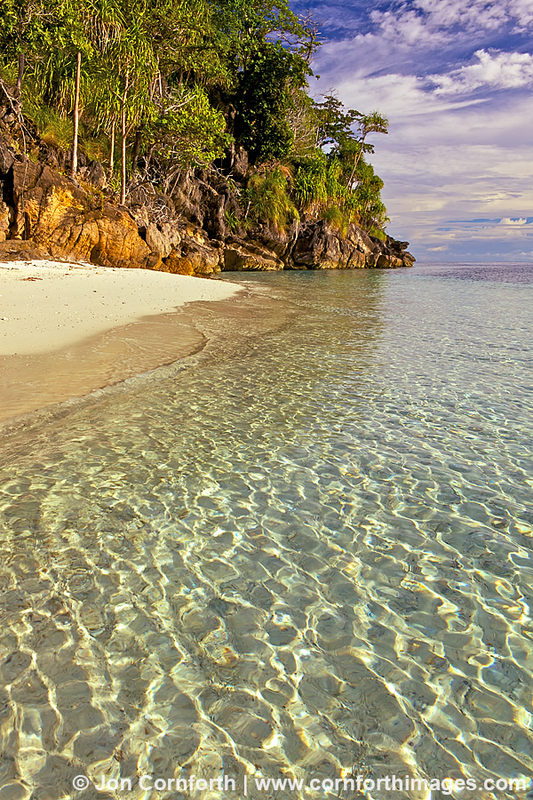 Unfortunately, plastic is everywhere in our oceans and remote Raja Ampat is no exception. I was initially focused on using the sandy beach as my foreground, but could not figure out how make that composition work, so I moved out into the shallow water. I was immediately captivated by the sunlight refraction patterns and set about making them the foreground leading into the tropical island. I created this image when the sun was higher in the sky than I normally photograph, because the light had to be intense enough for the refraction patterns to be visible. I named this beach in honor of Marit Miner, who is one of the owners of the resort and who’s home is also built on this island. I created this image using my Canon 5DmkII, Carl Zeiss 28mm f2 ZE lens, and Singh-Ray LB Warming Polarizer. This image required minimal processing using Aperture 3 and Photoshop CS5. I left the Misool Ecoresort in Indonesia 3 weeks ago today, but it still feels like it was just yesterday. It was probably my favorite photography trip that I have ever done and I can not wait to return. I’ll likely lead a photo tour there in the fall of 2012. I am only about 1/3 of the way through editing my images, but I already have a few favorites. Take this comical picture of a juvenile clown anemonefish. I spent a lot of time photographing these aggressive little fish during 2 weeks of scuba-diving. They constantly darted around, hiding in the anemone’s tentacles, but every once in a while I photographed a perfect moment where the fish had clear eye contact with the camera. Unfortunately, I could not do much about it’s “frowning” face, but hopefully it contributes to the humor of this image. I looked for patterns of consistent form and texture of the tentacles and waited until the fish swam into the most aesthetically pleasing sections. Also, I was surprised to learn that this type of clownfish, which most people recognize from the movie Finding Nemo, is actually called a false clown anemonefish. A true clown anemonefish has more pronounced black bars on it’s body. I created this image using my Canon 5DmkII and 100mm f2.8 macro lens in my Ikelite 5DmkII housing with dual Ikelite DS160 strobes set on TTL. This image required minimal processing using Aperture 3 and Photoshop CS5. Of all my photos that I created during my recent Indonesian adventure to the Misool Ecoresort, this is the one that I had most envisioned. 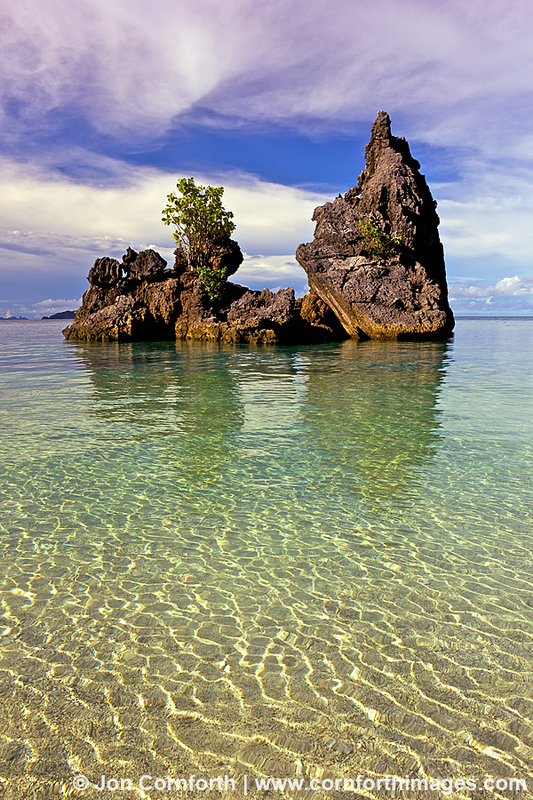 Indonesia is well known for its spectacular reefs, and Raja Ampat is considered to have some of the most pristine in the world. I was not disappointed. Before my trip, I was anxious about my learning curve to create an image like this. I think that every photographer should try taking a picture outside of their comfort zone once in a while. I initially struggled with balancing an ambient light exposure with fill-flash from my powerful underwater strobes, but I overcame these limitations after my first few days of diving. Freeing myself from the technical aspects of underwater photography allowed me to focus on composition. Once I figured out where to look for soft corals on the side of boomies (underwater pinnacles), I was able to realize my creative vision. Clearly the focus of this image is the neon soft corals surrounded by tropical fish, but I added texture to an otherwise featureless blue background by angling my camera up towards the surface. The clouds in the sky above also added color. I find it interesting that clouds play an important role in underwater landscape photography just like they do above water. I created this image using my Canon 5DmkII and 17-40mm f4 lens with a +3 diopter in my Ikelite 5DmkII housing with dual DS160 strobes set to -3 power. This image required minimal processing using Aperture 3 and Photoshop CS5. 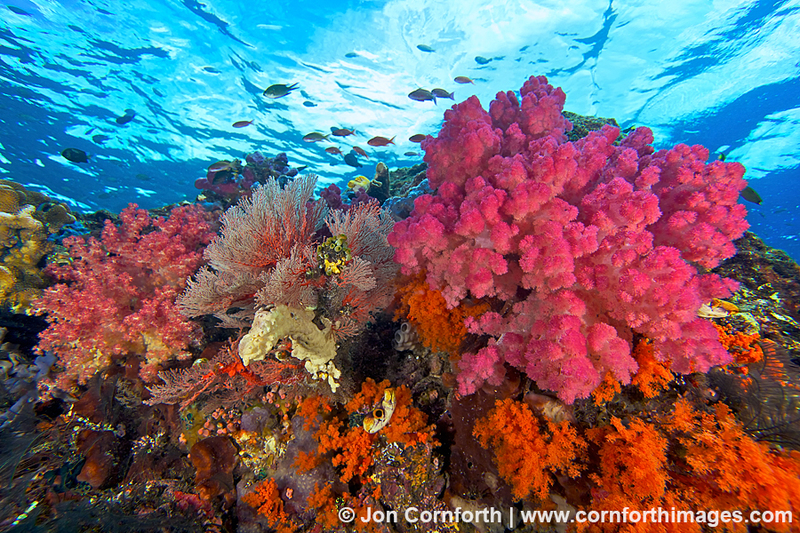 During my recent journey to the Misool Ecoresort in Raja Ampat, Indonesia, my main ambition was underwater photography. 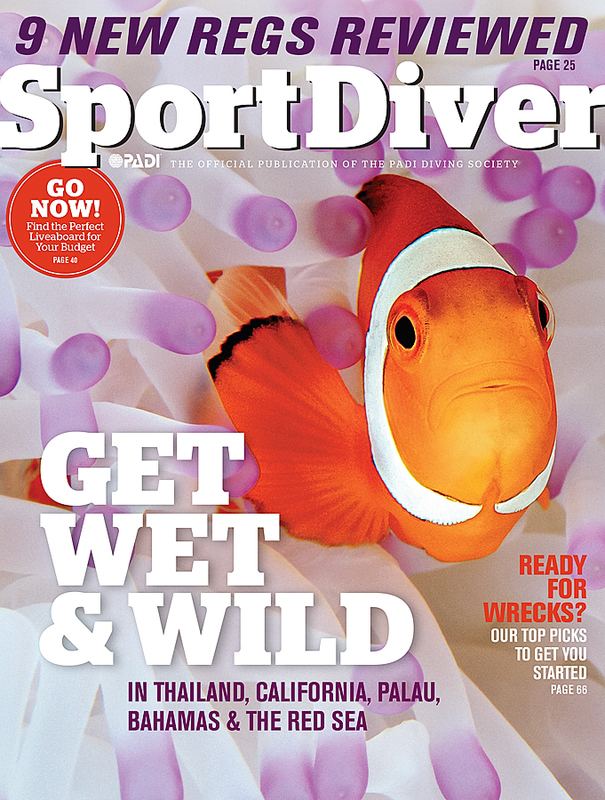 I created most of my images while scuba diving at a depth of 10-20m. However, I made this dramatic image in the shallow water located between the dive center and restaurant. 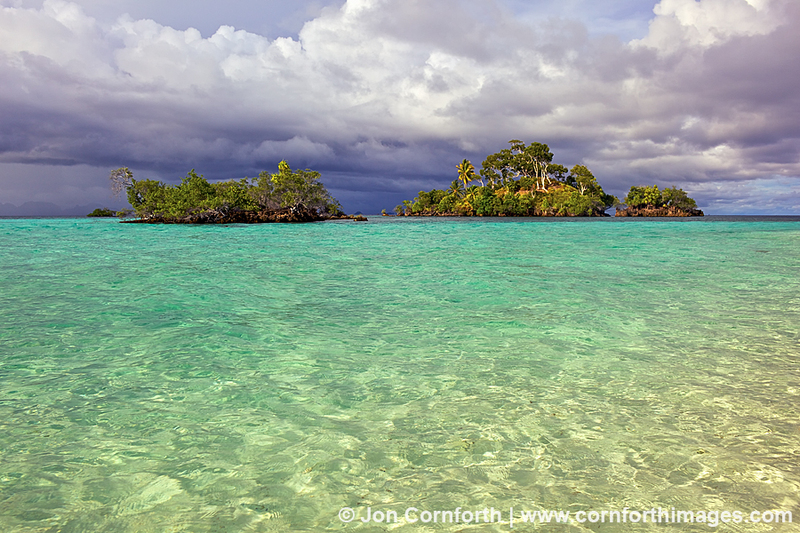 This beautiful tropical lagoon was composed of a white sand beach and teemed with baitfish and baby blacktip reef sharks. I had originally intended to photograph these creatures, but when I discovered the reflection of the coconut palm trees on the surface I turned my attention to photographing this instead. I was also drawn to the spectral refraction patterns on the sandy bottom, but the surface reflection is really where any good wide-angle underwater image can be found. I created this image without looking through my viewfinder through trial and error until I figured out how far back to angle my camera housing while it rested in the sand. I used my Canon 5DmkII and Canon 17-40mm f4 lens with a +3 diopter inside of my Ikelite 5DmkII housing with my 8″ dome port. This image required minimal processing using Aperture 3 and Photoshop CS5.